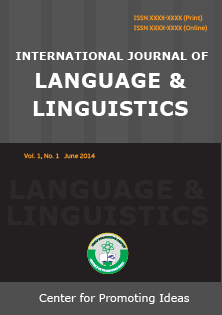 International Journal of Language & Linguistics (IJLL) is a quarterly peer reviewed journal published by Center for Promoting Ideas (CPI). It covers the areas of business and social science such as management, marketing, finance, economics, banking, accounting, human resources management, international business, hotel and tourism, entrepreneurship development, business ethics, international relations, law, development studies, population studies, political science, history, journalism and mass communication, corporate governance, cross-cultural studies, public administration, psychology, philosophy, sociology, women studies, religious studies, social welfare, anthropology, linguistics, education and so on. IJLL publishes original papers, review papers, conceptual framework, analytical and simulation models, case studies, empirical research, technical notes, and book reviews. IJLL is inviting papers for the upcoming issue of the journal.